Organic composting forms the backbone & basic necessity of a poor farmer. The traditional methods are not sufficient & satisfactory for chopping the crop residues. Whereas buying the chemical fertilizer is not possible for every farmer due to its high cost and also food waste contains high calorific and nutritive values. In all the cities and places, organic waste is dumped or disposed in landfill or discarded, which causes the public health hazards and diseases like malaria, cholera, typhoid. Inadequate management of wastes like uncontrolled dumping bears several adverse consequences. 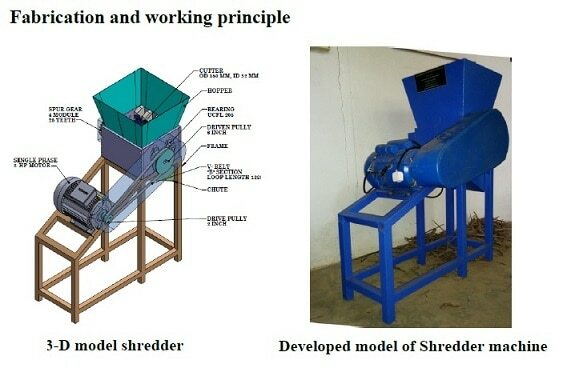 Shredding machine is used for shredding and converting macro organic waste products into small or micro easily decomposable form, which can be used as organic manure. Organic waste shredder designed should perfect to shred all kinds of waste products. The organic waste shredded will be in small pieces to enable the farmer to make use of it as feed for manure or organic manure and biogas feed. This shredder can be operated with a motor. Organic waste, or green waste, is organic material such as food, garden, agriculture and lawn clippings. It can also include animal and plant based material and degradable carbon such as paper, cardboard and timber. Burying organic waste in landfill is a big problem. Hence first we have to know the necessity/reasons for solid waste management. Food waste is the organic material having the high calorific and nutritive values to microbes, that’s why efficiency of methane production can be increased. In all the cities and places, organic waste is dumped or disposed in landfill or discarded, which causes the public health hazards and diseases like malaria, cholera, typhoid. Inadequate management of wastes like uncontrolled dumping bears several adverse consequences. It is not only polluting ground water and surface through leachate but also promotes the breeding of flies, mosquitoes, rats and other disease bearing vectors. Also, it produces unpleasant odor and methane which is a major greenhouse gas contributing to global warming. Agriculture is the major occupation in many parts of the world and producing a range of waste waters requiring a variety of treatment technologies and management practices. The basic occupation of 70% of the population in India is majorly dependent on Agriculture. A variety of crops are cultivated in India. But after harvesting them the crops wastages are either burnt out or thrown as waste without taking into consideration of their nutritive value. With the increase in the population our aim is not only to stabilize agriculture production but also to increase it further in sustainable manner. Excessive use of agro-chemicals like pesticides and fertilizers over years may affect the soil health and lead to declining of crop yields and quality of the products. Hence, a natural balance needs to be maintained at all costs for existence of life and property. The obvious choice would be judicious use of agro-chemicals and more and more use of naturally occurring materials in farming systems. Agriculture waste, which includes both natural and non-natural wastes. The conventional agro-waste disposal is a traditional and oldest method of waste disposal in which agriculture wastes are dumped as it is to degrade in a particular place for decomposing. As the waste are dumped, it takes more time to degrade and it causes environmental pollution. Hence the shredder machine is used for shredding i.e. converting of macro agriculture waste and food waste into small easily decomposable form, which can used as organic manure. The small size waste will decompose faster than the large or macro size waste. This decomposed waste can be used for the crops and this leads to improving in the growth and quality of the crops and also improving the soil chemical properties such as supply and retention of soil nutrients, and promotes chemical reactions. In this Shredding machine, the Organic waste like Agriculture waste, Kitchen Debris, cooked foods etc are fed into the machine vertically through hopper on to the cutters. Cutters are mounted on shaft supported by bearings which is mounted on the machine frame. One shaft driven by motor and another shaft driven by spur gear both shaft rotated in opposite direction. The motor is rotated at certain speed 1440 rpm and with it coupled with gear box to reduce the speed and to increase the torque. When the crop or waste come in contact with the rotating cutters or blades then the shearing action takes place. Due this shearing action, the large size waste converted into small micro size. This small size wastage will decompose faster than the macro size. The clearance between the rotating blades depends upon the size of the organic waste used for chopping. The chopped organic waste comes out of the machine and undergoes decomposition.